The Union Fire Company No. 1 of Hamburg has a rich and exciting history dating back 175 years. 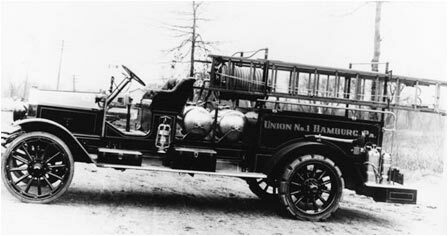 Organized fire protection first became available to the residents of Hamburg in 1832. The Union Fire Company No. 1 of Hamburg was officially organized on October 6, 1832, five years prior to the incorporation of the Borough of Hamburg. Records available only date back to June 19, 1865, when Edward F. Smith, a former Militia Captain, presided at the meetings. The meetings were held for the purpose of organizing a fire engine and hose company. Prior to this the company utilized a hand pumping apparatus, which was obtained prior to the Civil War. In 1866 the borough erected a brick building to house equipment and hold meetings. Borough Council also met in this building for many years. The building was later sold to the Union Fire Company in July of 1946 for the cost of $4,025.00. The building is still used by the fire company, housing apparatus and other equipment on the first floor and a meeting room and office on the second floor. The 1866 engine house with the Silsby steamer, hand drawn ladder truck, and a hose cart. 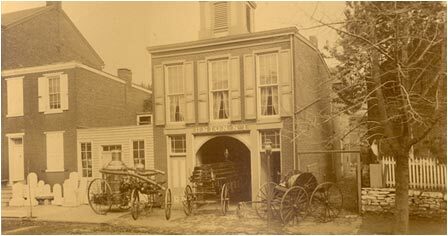 On September 5, 1870 another fire company reorganization meeting was held. Meetings continued to be held on a regular basis throughout the next six years. In 1877 a new Silsby steam engine was purchased at a cost of $4,000.00. 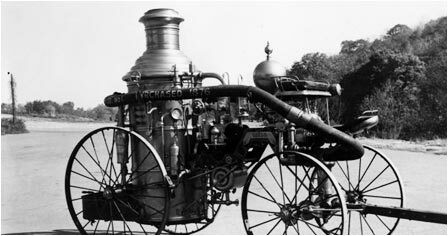 This was the first "modern" piece of firefighting equipment purchased by the company. The engine is still a part of the organization, and is housed in the 1866 engine house. The unit served the company very efficiently up until the introduction of motorized vehicles. The next major improvement took place on April 30, 1884 when the company purchased a "hand-drawn" hook and ladder truck. The unit was purchased :fully equipped" at a cost of $583.61. The following year a "hand-drawn" hose cart was purchased on February 20, 1895 at a cost of $525.00. The cart is reported to have been painted purple. A second hose cart was again added to the fleet in 1887. Two more carts were also added in later years, giving the company a total of four hose carts. Fire hydrants were installed in the borough around this time. The hydrants were installed at the upper end of Main Street (now Fourth Street) and at other locations along the canal and creeks where a good water supply could be obtained. From these hydrants, every point in the borough could be reached with several hundred feet of hose. It was also around this time that a bell was installed on the engine house tower to better notify the fireman of an emergency. On December 10, 1915 discussions were begun to go through the process of forming a eneficial Relief Association. The following year the company would purchase its first mechanized vehicle. The company purchased a 1916 Hahn chemical truck on January 14th of that year. On March 16th of that year the company began its Tuesday night training and equipment checks, a practice that remains in effect to this day. On April 9, 1920 the Beneficial Relief Association was officially incorporated, and on October 8th of that year a new electronic siren was placed atop the old bell tower to better notify both the firefighters and the community of a fire. On May 23, 1923 the company purchased its second motorized truck. The truck was a 1923 Hahn combination chemical and pump truck, capable of pumping 750 gallons of water per minute, and costing $9,500.00, almost 4 times the cost of the 1916 truck. The new pumper was an improvement over the 1916 chemical truck, which used only a chemical reaction to ressurize the water, instead of using a pump. On August 16, 1923 the first bell telephone was installed in the fire hall, making communication more efficient. It would be 10 years later until the company would purchase another truck. That purchase came on August 11, 1933 when the company purchased a 350 gallon per minute pumper from Hahn Motor Truck Co. at a cost of $3,590.00. Two years later, in 1935, another truck was acquired, this time a Ford-Hahn chemical truck. This truck served the company for several years, and was refurbished in 1943. In 1943 the old chemical system was replaced with a more modern, 500 gallon per minute, front mounted pump. 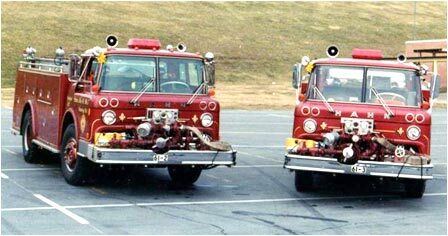 In 1951 the 1923 and 1933 Hahn trucks were replaced with two identical 1951 Ford-Hahn pumpers. These two trucks were exactly the same with one exception; one was equipped with a 500 gallon per minute pump, while the other had a larger 750 gallon per minute pump. These would be the last two open roof trucks purchased by the company. 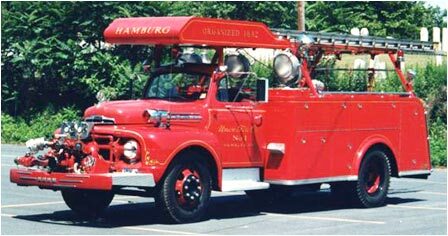 The 1935 Hahn pumper was also completely rebuilt in 1951 and would go on to serve the company for many years to come. On May 9, 1952 the first radios were introduced into the company. One Motorola master unit, and four Motorola mobile radios were purchased at a cost of $3,195,15 (installed). The following year twenty-five call boxes were purchased to be placed in the homes of the active firemen. On May 19th telephone panels were installed for civil defense purposes. On September 11, 1953 the idea of connecting all of the Zone 2 companies was discussed. The system would have amburg as the dispatching center for the zone, which consists of Hamburg, Shartlesville, Shoemakersville, Virginville, and Leesport. The plan was never finalized however, due to lack of funding. 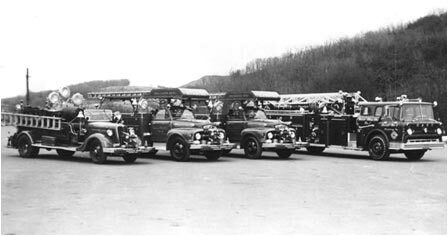 Having radios in the trucks made communications much better, however the Chief still did not have a radio to be able to give instructions to the arriving trucks. It would be two years later on January 4, 1955 that the chief’s personal car would be equipped with a mobile radio. Today the chief and each of the three assistant chiefs have radios in their vehicles. On May 5, 1956 the Field House was dedicated. The idea for the field house was conceived in 1953 and the facility was designed and engineered through 1953 and 1954, with ground breaking occurring in May of 1954. The Field House was first used in 1955, while still under construction. The cost of this project was $189,600.00, with no cost to the Hamburg taxpayers. 23 years later, on July 20, 1979 a special meeting was called to discuss the proposed sale of the structure to the Hahn Motor Company. The company made a proposal to purchase the building for $200,000.00. The results of the meeting were 22 yea votes and 149 nay votes. The building stayed within the organization and is still run by the fire company. On November 9, 1956 thirty more call boxes were purchased to be placed in the homes of the firemen. These boxes were more advanced than their predecessors and were tone activated so that they would only broadcast when Hamburg received a fire call. 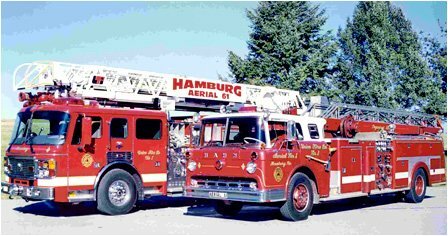 The company made a significant investment in 1961 with the purchase of a Ford-Hahn-Grove (750/500/65) 65 foot ladder truck. The truck was equipped with a 750 gallon per minute pump, 65-foot Grove aerial ladder, and numerous ground ladders and tools. This truck would serve the company for nearly forty years, before being replaced in 2000. The company again made investments in 1967 and again in 1972, purchasing identical Ford Hahn 750 GPM pumpers. The trucks replaced the 1935 Hahn and one of the 1951 Hahn trucks. The two new trucks were nearly identical in every way and were affectionately referred to as "the twins" by the firemen who came to rely on them. At this time the company had four large trucks housed in a one bay engine house. This was a tight fit by anyone's standard. On October 1, 1976 a special meeting was held for the purpose of accepting a proposal from the Pendergast family to erect a combination engine house and storage building adjacent to the xisting engine house. The meeting resulted in 25 yes votes, 7 no votes, and 2 members who abstained from voting. One week later, on October 8th, a committee was formed to oversee the construction of the building. In June of 1979 plans were received and forwarded to Harrisburg for approval. The Ernst Construction Company, of Hamburg, was awarded the contract for the erection of the new building. The new engine house currently houses five trucks. On April 14, 1978 a committee was appointed for the purpose of acquiring a Hurst "Jaws-of-Life" rescue tool. The first rescue tool was purchased through a combination of funds donated by local civic groups and fire company monies, and was put into service in August of 1978. Since that time the company significantly has expanded its rescue arsenal and now carries a variety of tools on different trucks, allowing for crews to work at two different accident scenes simultaneously. In 1979 the company again looked to modernize the fleet. However, this time they were not just looking to modernize, but also to expand. 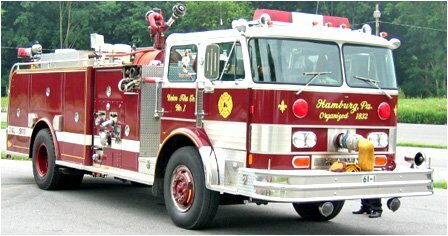 A committee was formed to oversee the purchase of a new engine, and on April 12, 1980 the company purchased a 1000 GPM custom pumper from Hahn Motor Company. 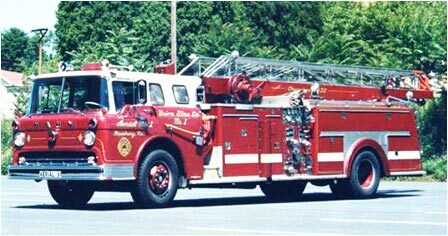 The 1980 Hahn, referred to as Engine 61-1, was the first truck purchased with an automatic transmission. 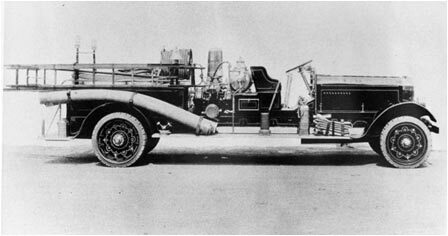 This truck was the first-due truck for building and vehicle fires, and still carries that same duty to this day. While other newer trucks have since been added to the fleet, none have surpassed the abilities of this classic truck. Some members have even nicknamed it "The War Wagon" because you can take it into any battle. As the years went on, the fire company responded to more and more car accidents. In 1986 the company purchased its first rescue truck, a 1986 Hahn truck with a Saulsbury rescue body. This truck would be the last Hahn purchased by the organization. The Hahn factory, which was located within the borough of Hamburg, would close a few years later. In 1992, the 1967 Ford Hahn was replaced with a new 2000 GPM Fire-Fox engine from Kovatch Mobile Equipment (KME). This is the largest engine owned by the company and it was designed to be a water supply engine with its large pump and 2000 feet of large diameter hose. Two years later the 1972 Ford-Hahn would also be replaced by a KME engine. The new engine, designated Engine 61-2, was designed with a short wheelbase and four-wheel drive capabilities to allow it to operate in areas that the larger trucks traditionally could not access. In 1997 the company expanded again, this time through the acquisition of a brush truck. The truck was gained through the Department of Conservation of Natural Resources (DCNR), which oversees the forestry crews. The truck was a 1965 Kaiser 2 ½ ton truck that was formerly used by the United States military. The unit was retrofitted with a tank, pump, and hose. By 1999, after 38 years of service, it was time to replace the Hahn ladder truck. The decision was made to purchase a new American LaFrance 100 foot aerial ladder truck. The new truck arrived in 2000 and included a 6 man, fully enclosed cab, and numerous other state of the art improvements, including two master stream devices. The past 175 years have been full of both change and excitement. We look forward to the future and all that it has to offer.